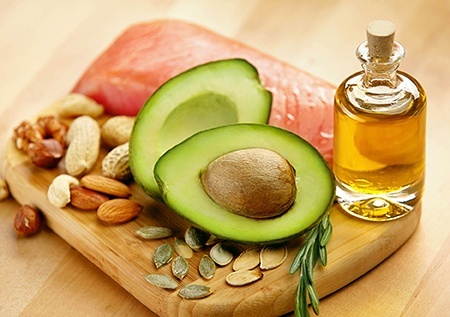 Home > Resources > Lifestyle Tips > Fats Explained-What Is Fat And Why Do We Need It? In the early 90s dietary fat was considered a “villain” and carbohydrates were the “heroine”. The thinking was that by lowering fat in the diet you could decrease the risk of heart disease. Many began to believe that eating fat, made you fat. As a result the food industry began replacing fat with carbohydrates in food products leading to greater consumption of low-fat, high-sugar foods (think Snackwells cookies). While fat does provide more calories per gram (9kcal/gram) compared to carbohydrate and protein (4kcals/gram), we now know it’s not as simple as swapping out one ingredient for another. 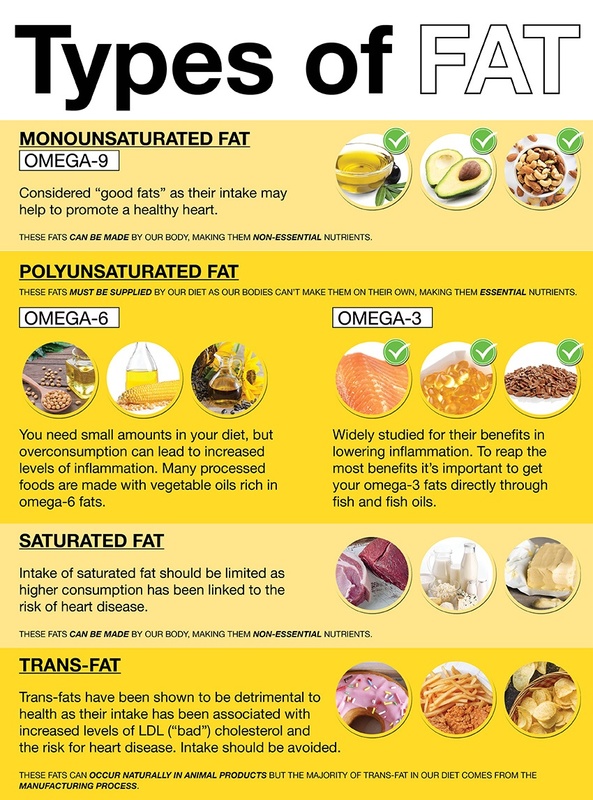 In fact there are many benefits to be gained by consuming the right types of fat, the key is moderation. Here we’ll break down what fats are, why you need them, and what to know when choosing them. Omega-6 Fats: Linoleic Acid is an essential omega-6 fat that has the ability to be made into Arachidonic Acid, a precursor to hormones (prostaglandins, thromboxanes and leukotrienes) linked to inflammation. You need small amounts in the diet, but overconsumption can lead to increased levels of inflammation. Since many processed foods are made with vegetable oils rich in omega-6 fats, most Americans are overconsuming these fats in their diets. Sources: Listed as "partially hydrogenated vegetable oil", found in many processed foods and most bakery products (cookies, cakes, crackers and pastries). When making a Zone meal we recommend aiming for one that is under 12 grams of fat with 25 grams of protein, about 35 grams of net carbs (total carbohydrates minus fiber) and approximately 400 calories or less. When you have the right amount of fat, balanced with protein and low glycemic carbohydrates, it helps minimize hungry and fatigue for up to 4-5hours. EPA and DHA are the two omega-3 fatty acids that have been most widely studied in the literature for their clinical benefits in lowering inflammation. 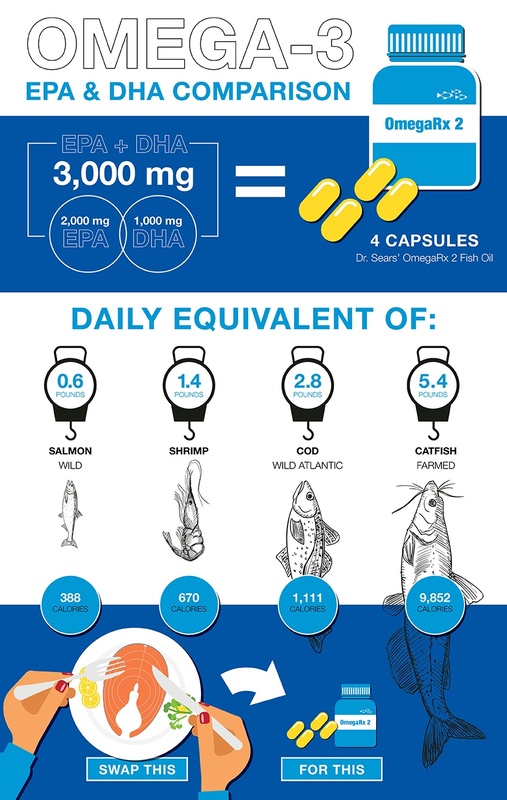 Dr. Sears recommends individuals consume at least 3000mg of EPA and DHA daily for wellness. It would be difficult to meet this recommended intake of EPA and DHA from eating fish alone. While there are benefits to consuming fish, the current recommendations for adults (excluding pregnant woman and children) is to consume no more than 12 ounces of fish per week to minimize intake of contaminants like mercury, polychlorinated biphenyls (PCBs), and dioxins. This is why we recommend OmegaRx 2 as it’s highly purified to remove as many PCBs as possible making it your best choice for purity and potency. Try our zesty avocado dip as a dressing or on the side with chicken and spinach salad. In a blender blend together avocado, mango and lime juice. Grill the chicken breast and top with avocado dressing (or on the side). Serve with spinach salad topped with Zoned Herb Dressing (made ahead of time) and Brussels sprouts drizzled with extra virgin olive oil, salt and pepper.